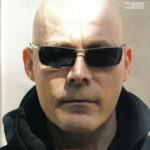 Andrew Eldritch is the English front man, singer, songwriter and only remaining original member of The Sisters of Mercy, a band that emerged from the British post-punk scene, transformed into a gothic rock band and, in later years, flirted with hard rock. Formerly a drummer, Eldritch also programs the tracks for The Sisters of Mercy’s drum machine (known as “Doktor Avalanche”) and plays guitars and keyboards in its studio recordings but uses live shows to focus solely on his vocal performance. "I still like being in North of England and I keep a place there. But there are a lot of things about the Continent that are to be preferred. The social institutions work better, women have a better position in society and the food is another thing." "Nothing has changed in our relationship with East West. We have no relationship with East West. We’ve been withholding our labour for almost seven years now." "People have taught me not to look for intelligence in rockmusic."